Department of agglutinating products - 46 529 production items; Department of Tactivin - 52 449 packs. Awards and Achievements: J.S.C. “Biomed”- Mechnikov is one of the oldest manufacturers of immunobiological products. Main business lines: Manufacturing of vaccines, interferons, allergens, immune response-modulating agents and other pharmaceutical products; manufacturing of diagnostic products. Total area: 109 thousand sqm. Manufacturing area: 21 thd. sqm. Infrastructure: J.S.C. “Biomed”- Mechnikov has its own infrastructure and utilities in place to ensure high-quality product manufacturing. Specifically: • 3 manufacturing buildings; • 7 manufacturing divisions; • microbiological and biochemical laboratories. All production processes are carried out in the premises of a high cleanliness class. continuous, adjustable operation. The line has tooling for 1-2 ml and 5 ml ampoules. J.S.C. 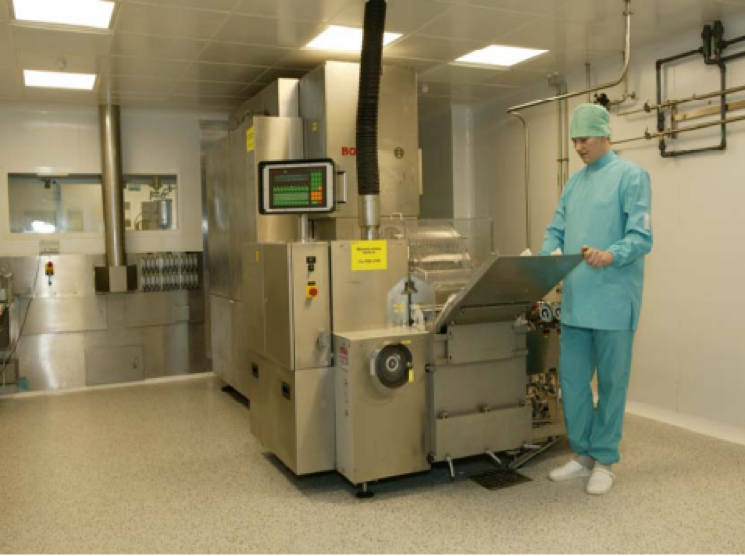 “Biomed”- Mechnikov is one of the oldest manufacturers of immunobiological products. The company was not accidentally named after the outstanding biologist I.I. Mechnikov. Many renowned students of I.I. Mechnikov, like L.A. Tarasevich, L.N. Diatroptov, E.N. Martsinovsky, A.I. Abrikosov, made contributions to its establishment and development. J.S.C. “Biomed”- Mechnikov was established as the successor of the Moscow Research and Development Institute of Vaccines and Serums founded in 1919. It was here where the manufacturing of diphtheria scarlet fever vaccine, scarlet fever, antigangrenosum and antitetanic serums was launched. The first manufacturing of human blood-derived products in Russia was also launched here (anti measles gamma globulin, albumin and fibrinolysin). In 1988, the manufacturing facilities were separated from the Institute. At that moment the company acquired its name, J.S.C. “Biomed”- Mechnikov. 2005 Upgraded the manufacturing facilities for interferon and allergens. Reconstructed the microbiological and chemical laboratories. Reconstructed the manufacturing facilities for vaccines. 2012 Obtained Certificate of compliance of the quality management system with the requirements of GOST R 9001-2008 (ISO 9001-2008) No. РОСС RU.ИФ99.К00002 issued with respect to development, manufacturing, quality control, storage and sale of medicinal products as sterile dosage forms (liquid sterile dosage forms, manufactured under aseptic conditions, large and small dosage forms, including eye drops, solid sterile dosage forms (lyophilized products)), biological medicinal products (vaccines, blood products and some others), substances (active pharmaceutical ingredients), medical devices (diagnostic agents, dehydrated media, diagnostic serums, diagnostic immunoglobulins, reagents kits). 2016 Obtained Certificate of compliance of the quality management system with the requirements of GOST R ISO 90001-2015 (ISO 9001-2015) No. РОСС RU.ИС11.К01115 issued with respect to manufacturing of medicinal products and medical devices (agglutinating serums, immunoglobulins and diagnostic agents). 2017 "The quality management system of the plant proved to be efficient and passed successfully the scheduled certification audits of 2016 and 2017 for compliance with the requirements of GOST ISO 9001-2015 with respect to manufacturing, storage and sales of pharmaceutical substances and sterile medicinal products". 1. Program of deployment of products labeling with identification marks, products batching and aggregation. 2. Program of actions for updating of Normative Documents, methods of control and normalization of therapeutic and diagnostic allergens.